There has been an enormous increase in interest in mHealth, particularly the possibility of leveraging mobile phones and wireless devices to improve all areas of health care. As the chart below documents, the projected uptake of smart phones is rapid. There are now more cell phones in the United States than people. 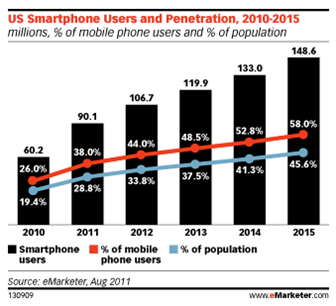 Mobile devices will outnumber global population by the end of 2012. The typical adult checks their smart phone at least 30 times per day. The average teen sends more than 3,000 texts per month. There are currently 40,000 mobile health apps available and 247 million individuals have downloaded at least one to their mobile device. By 2020, at least 160 million Americans will be monitored and treated remotely for at least one chronic condition. The rapid uptake of smart phones which are essentially computers on your hip, if developed correctly can create the “holy grail” of health care, an empowered patient with resources and tools to better manage their own health. In the coming series I am going to address some of the key issues with the mHealth opportunity. Stay tuned. This entry was posted in mHealth, Preventive Medicine, The Industry, U.S. Preventive Medicine, Uncategorized and tagged Android, Android Market, Apple, Apple App Store, Apps for Health, Employee Health, Health, Health apps, Health monitoring, iPhone, Macaw, mHealth, Mobile Health, Prevention, Preventive Medicine, Smart Phones, Smartphones, Texting, Wellness, Wireless Health Care. Bookmark the permalink. 5 Responses to Will mHealth Revolutionize Health Care? – First in a Series..
You’re welcome, glad I was helpful. I am now not sure the place you’re getting your information, but great topic. I must spend a while studying much more or figuring out more. Thanks for wonderful information I used to be in search of this info for my mission.